The event started at 6pm, and we arrived at 5:50pm expecting to be the first people there, only to find a queue of eager ticket-holders already forming in the car park. 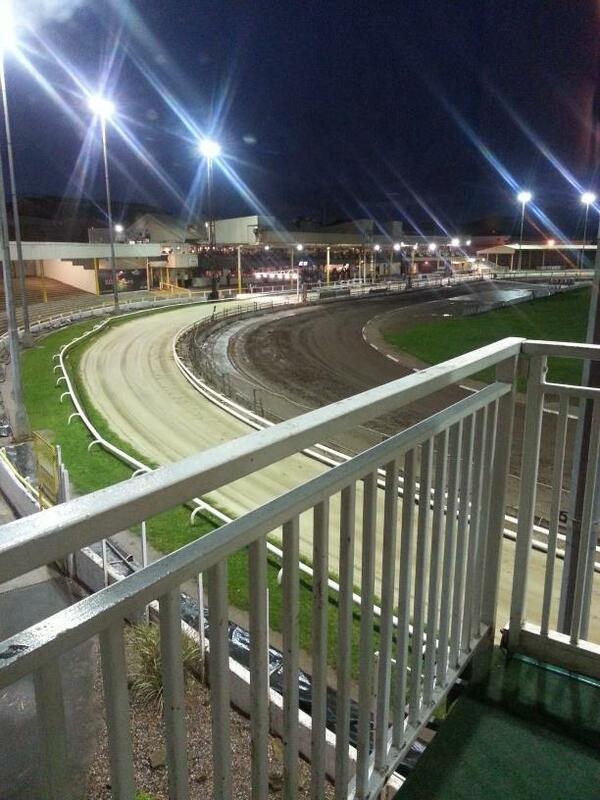 Clearly Owlerton Stadium is popular Saturday night spot! Once we’d finally worked our way to the front of the queue, we were shown to the venue’s Panorama Restaurant which offers fantastic views over the dog track. The whole restaurant is designed to pull you into the races happening below – as if the view over the track wasn’t enough, there’s also numerous television screens mounted around the room that cycle through a mixture of close ups, action replays and photo finishes of each race. The Panorama Restaurant is enormous, but by the end of the night the place was absolutely packed with people having a great time. I was also surprised by just how diverse the diners were – everyone from families with children in tow, to senior parties, to younger people who were clearly on a Saturday night out, dressed up and ordering bottles of fizz. This great mix of people only added to the atmosphere. The Panorama Restaurant itself has a fun, informal feel – this may have had something to do with the fact that many of the diners were wearing fuzzy dog ears, which the staff were handing out at the door. If there’s anything better than spending your Saturday night in a room full of people wearing furry dog ears, then I haven’t discovered it yet! As I’ve mentioned in pretty much every one of Napoleons’ reviews, gambling isn’t really my thing, but towards the end of the evening I did find myself getting caught up in the atmosphere and couldn’t resist having a flutter on a few dogs whose names made me chuckle (always the best approach if you have absolutely no idea what you’re doing). I can confirm that I’m about as successful at picking a winning greyhound as I am at roulette, so sadly I didn’t make my fortune on this particular evening. You eat at the Panorama Restaurant as part of a very reasonable package deal, which includes 3 courses, a table overlooking the dog track, and even a tote runner who pops by your table before each race and offers to place your bets for you – because no-one wants to get up halfway through a 3 course meal in order to go stand in a queue! When it comes to the food, the Panorama Restaurant specialises in unpretentious grub – it’s not fancy, but it’s enjoyable. Case in point, my starter of potato and leek soup with thyme and garlic croutons. This is a lovely winter warmer that manages to be rich and creamy without being too stodgy, and the croutons went heavy on the garlic, which I loved. My dining companion opted for an equally no-nonsense starter, in the form of Yorkshire puddings covered in Henderson’s onion gravy. The Yorkshire puddings were nicely cooked, which was a relief because I’ve ordered several Sunday roasts recently and the Yorkshire puds have always been black around the edges – this certainly wasn’t the case with Owlerton’s Yorkshire puds! But the Henderson’s gravy was what really made this starter special. This gravy had a really unique, tangy aftertaste that’s utterly addictive, to the point where I’ve made it my mission to replicate this Henderson’s gravy at home. Wish me luck! Onto the mains and I had opted for the mushroom, pumpkin and chickpea cottage pie with cheddar mash. This cottage pie is pure comfort food, especially the mash which tasted strongly of cheddar. The filling was also really tasty, with a good amount of mushrooms and chickpeas, although I struggled to taste any pumpkin in my pie. All in all, this was a lovely veggie cottage pie, and it was nice to see a vegetarian option that’s something different from the usual nut roast, veg wellington or vegetarian tart. 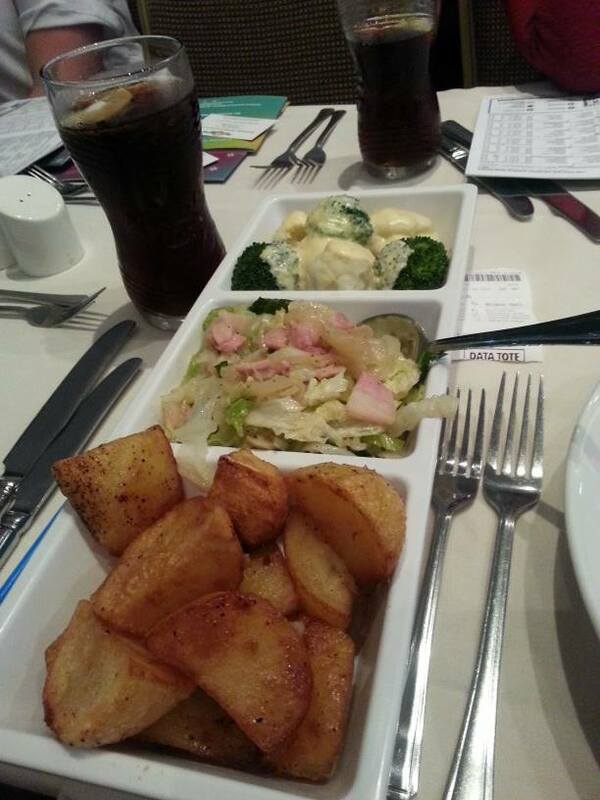 Each main course is served with a selection of vegetables and potatoes. When I ordered my cottage pie, the waitress had asked whether I was a vegetarian, and then explained that the regular side of vegetables and potatoes isn’t actually vegetarian friendly, so they’d need to make me a separate portion. The fact that the veg isn’t vegetarian friendly isn’t mentioned anywhere the menu, which I feel is a bit of an oversight, as there’s all kinds of dietary requirements that may mean finding bacon mixed in with your veggies isn’t going to be a pleasant experience. The side turned out to be cauliflower and broccoli covered in cheese, shredded cabbage, and a helping of roast potatoes. The roast potatoes were very nice too – strongly seasoned, crispy on the outside but light and fluffy on the inside, just like all good roasties should be. And if you’re interested, the non-veggie version of this side is more of the same, but with bacon bits mixed into the vegetables. Meanwhile, my friend had opted for the slow roasted belly pork, which was served with braised red cabbage, apples, and a port and rosemary sauce. The portion of roast pork was absolutely enormous, and had a strong rosemary flavour, while the red cabbage and apples complemented the pork perfectly. The only criticism is that my friend would have preferred their crackling to be a bit crunchier. Onto dessert, and I couldn’t resist ordering the sticky toffee pudding with salted caramel sauce, while my friend was tempted by the plum and almond tart, which came with clotted cream ice cream. Strangely, both of us took a bite of our puddings and instantly had that horrible realisation that, even though there was technically nothing really wrong with either pudding, we’d ordered something that simply wasn’t to our taste. Whoops! Rather than wasting two puddings, we swapped plates and realised that, actually, we both preferred the other person’s pudding way more than our own. Disaster averted! The high point of my I-really-should-have-ordered-this-instead plum and almond tart, was easily the ice cream, as the clotted cream gave it an extra richness. Meanwhile, the sticky toffee pudding may not have been the greatest looking dessert in the world (and I did try my hardest to get a good shot of it) but my friend enjoyed the taste, which is all that matters. Since I’d visited Napoleons just a few weeks before, it’s difficult for me not to compare the two – and there’s one stark difference. Whereas Napoleons’ restaurant clearly sets out to stand on its own, at Owlerton Stadium it’s impossible to separate the food from the greyhound racing. Everything from the restaurant’s layout, to the tote runners, to the fact that the lights are turned off at the start of each race, seems designed to pull you into the greyhound racing, to the point where there’s no way you’d visit Owlerton Stadium if you didn’t intend on placing at least a couple of bets throughout the night. If you enjoy a few cheeky bets in general or greyhound racing in particular, then Owlerton is a really fun night out. The atmosphere is fantastic, and during this particular Saturday the whole venue was packed with people having a fantastic time. The food was also enjoyable, especially considering the price (3 courses for £15 is great value, even without the added entertainment) and I enjoyed everything except my original pudding. If you’re planning a trip to Owlerton Stadium, then you should really look into booking yourself a table at the Panorama Restaurant. Recently, I was lucky enough to receive an invitation to sample the new menu at the Owlerton branch of Napoleons casino and restaurant on Livesey Sreet. But, this wasn’t just the launch of a new menu; the venue has also just had a £2 million refurbishment and extension. The invite promised a brand new, 60 seater restaurant, a new bar and lounge area, an extended gaming floor, plus the first outdoor gaming terrace outside of London. Pretty exciting stuff! When we arrived at Napoleons, we were greeted by Marketing Manager Rachel, who’d very kindly organised this ‘Foodie Preview’ evening for Sheffield-based bloggers and Tweet-ers. She fixed us up with some drinks, and then took us on a quick tour of the venue so we could see what’s new. The new bar and lounge area is now larger and more open than before. Previously, this area did feel a bit small and tucked away in the corner of the building, so this is definitely a big improvement. To be honest, the restaurant area looks pretty much the same as before, just with more seating. It still has the dramatic red and blank colour scheme, the same low lighting, and what looks like the exact same fixtures and furnishings. This isn’t a criticism, as I thought the restaurant area looked great before, so why fix something that isn’t broken? The tour concluded with a look at the outdoor gaming terrace, and Napoleons have done a fantastic job with this area. It’s completely sheltered and has a good selection of seating and gaming machines, so it doesn’t feel like you’re outside at all. I’m a non-smoker, but I do have friends who smoke, so I can appreciate the benefit of having a space where people can smoke outdoors without being exposed to the elements. Rachel also raised a good point that the outdoor gaming terrace means smokers can pick a machine and play on it all night if they wish, without having to risk losing their machine everytime they pop outside for a cigarette. Tour complete, it was time to take our seats and find out what Napoleons had in store for us this evening. I was excited to learn that, although we’d be choosing our main meal, we’d also each receive platters of different starters and desserts, so we could sample as much of the new menu as possible. 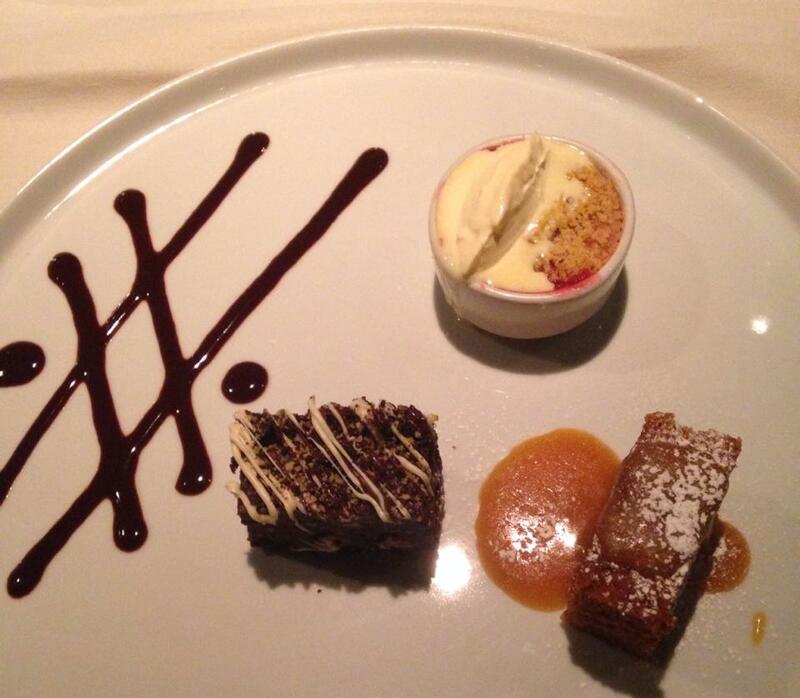 This is a great way to get a feel for a menu – and really, who wants one pudding, when you can have three? First up, was a platter of mini starters. 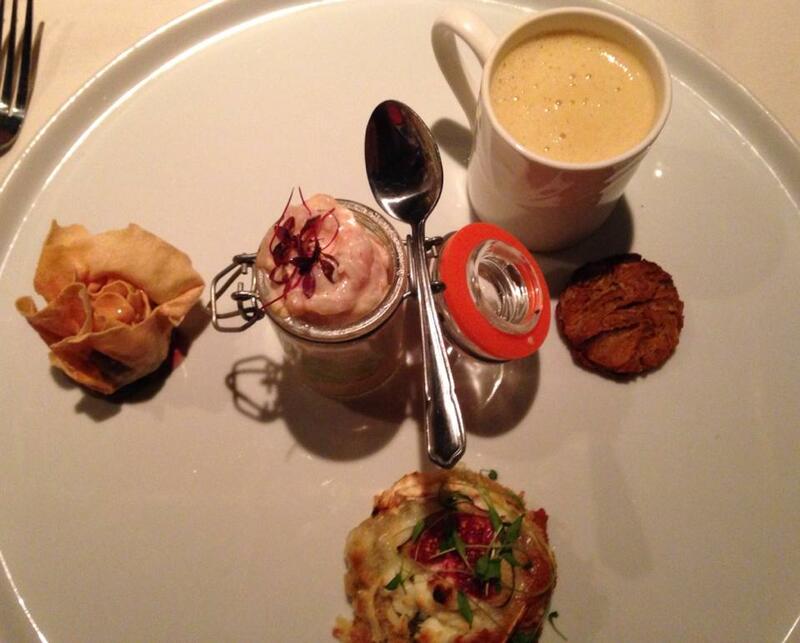 My favourite thing on this platter was definitely the parsnip cappuccino. This unique starter is served in a coffee mug, and even has a coffee-coloured, foamy top just like you’d find on a real cappuccino. The soup itself is creamy, satisfying, and slightly spicy – in other words, it’s the perfect soup for winter. 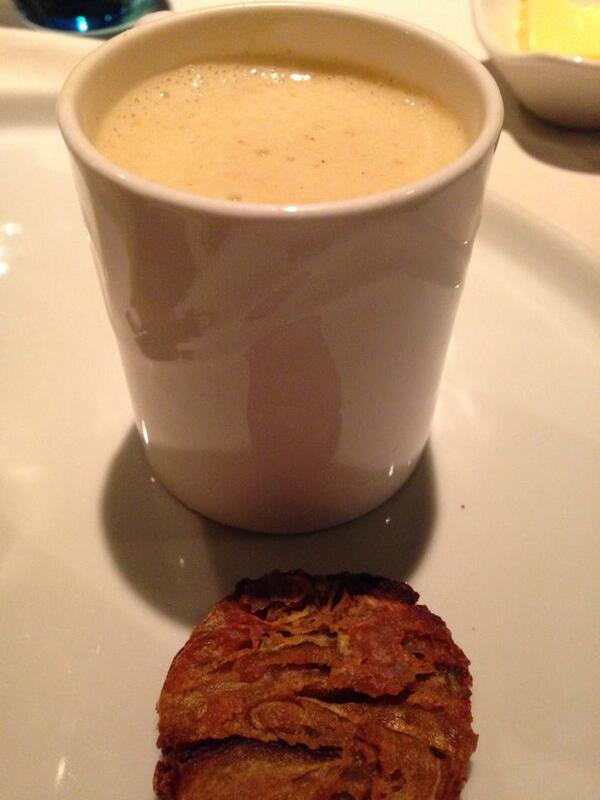 The parsnip cappuccino was served with a crispy, miniature onion bhaji on the side, which was perfect for dunking into the soup. Also on the platter was that old classic, the prawn cocktail. A prawn cocktail isn’t something I’d normally order from a menu, but this particular prawn cocktail was full of fresh and tasty prawns, and was very nicely presented. I was pleasantly surprised by how much I enjoyed it – and this is coming from someone who doesn’t really like prawn cocktails! The mini goat’s cheese and roasted fig bruschetta was much more my style. 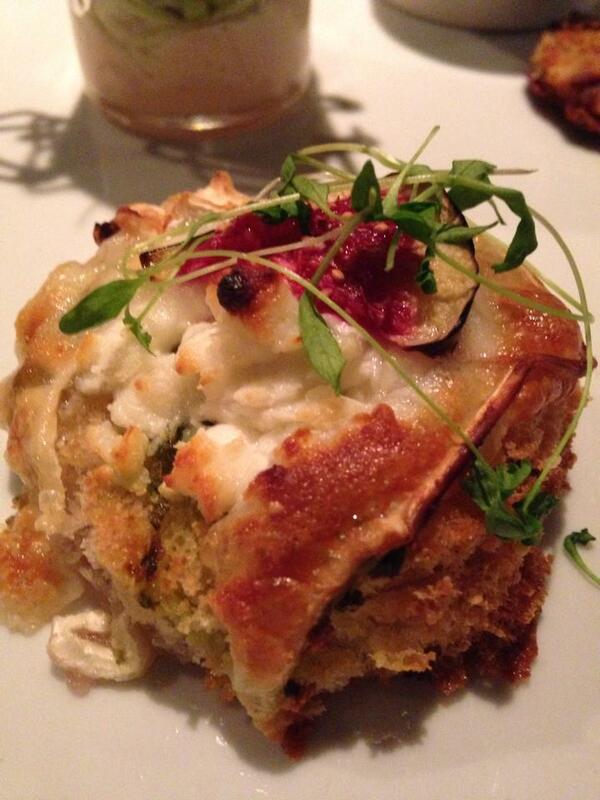 The tanginess of the goat’s cheese and the sweetness of the roasted fig was a winning combination. When I pay my next visit to Napoleons, I’m going to be torn between ordering this bruschetta, or ordering the parsnip cappuccino. The final starter on my platter, was a black pudding wonton. Since I don’t eat meat, I did a quick food exchange with my dining companion, in return for their goat’s cheese bruschetta (score!) They confirmed the wonton was just as tasty as the other starters and, even though they’re not usually a massive fan of black pudding, they wolfed down both wontons. Onto the mains, and this was the only course we got to pick ourselves. Well, I suppose a platter of main courses would have been a bit excessive! 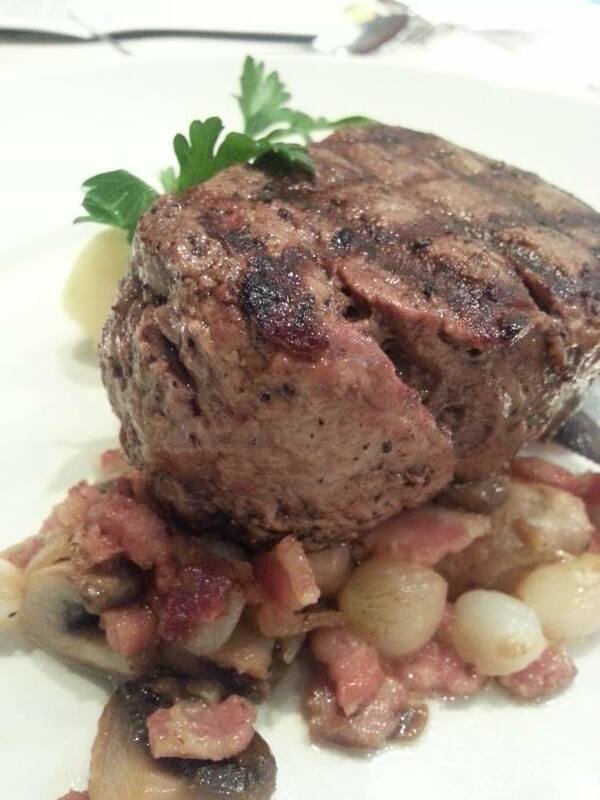 All the main courses on Napoleons’ new menu sound delicious, but it’s a very meat heavy menu. If you fancy fish, there’s two fish-based dishes to choose from, plus there’s a vegetarian main course of cherry tomato, pimento and basil linguini. 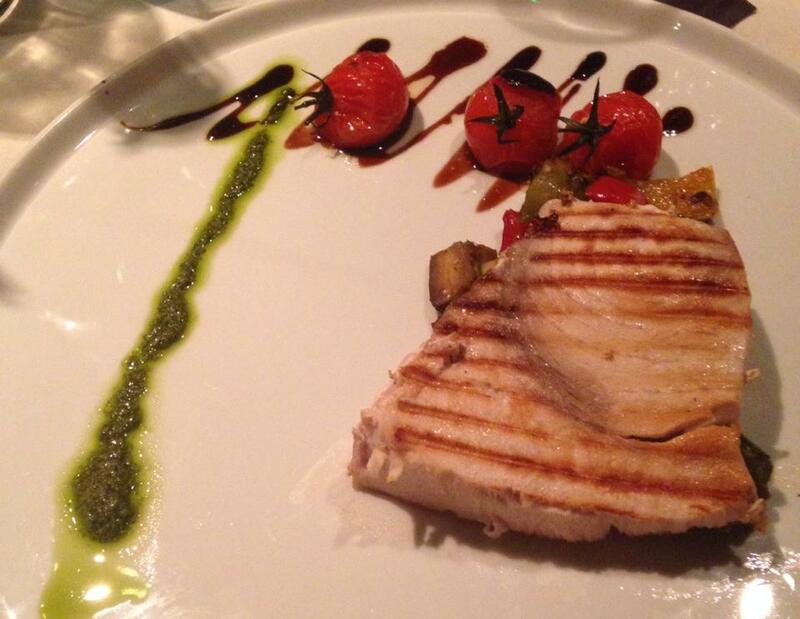 In the end, I opted for the grilled swordfish steak, confit of tomatoes and Mediterranean vegetables with salsa verde. When my meal arrived, I knew I’d made the right choice, because look at the size of that swordfish steak! My super-sized swordfish was tender, juicy, and full of flavour. This is the nicest piece of fish I’ve had in quite a while. 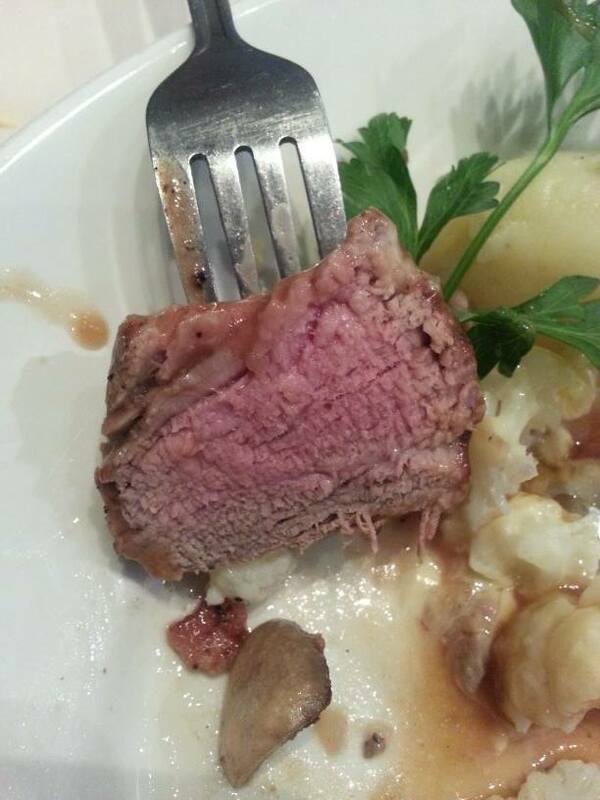 Meanwhile, my dining companion had gone for the chargrilled sirloin steak, which came with beef dripping potato wedges, Yorkshire pudding and horseradish jus. 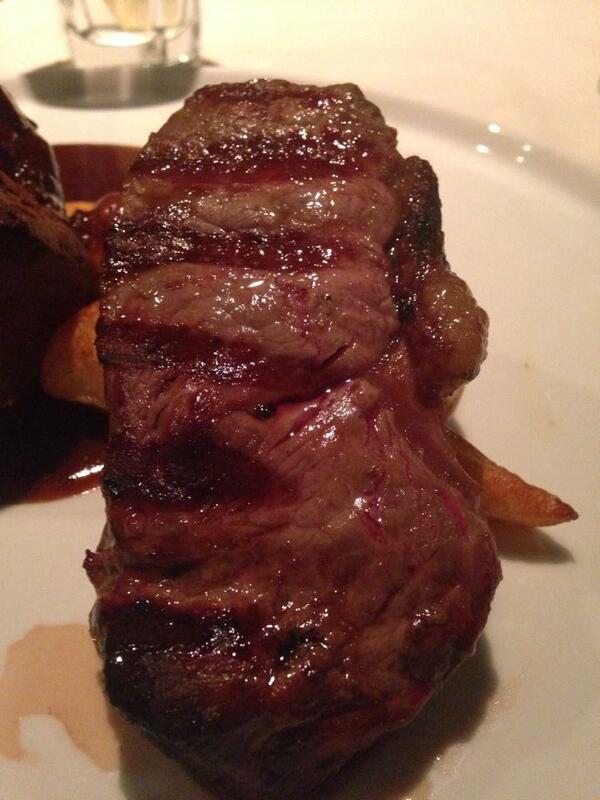 The steak was cooked exactly as requested (medium rare) and the potato wedges tasted of real beef dripping. 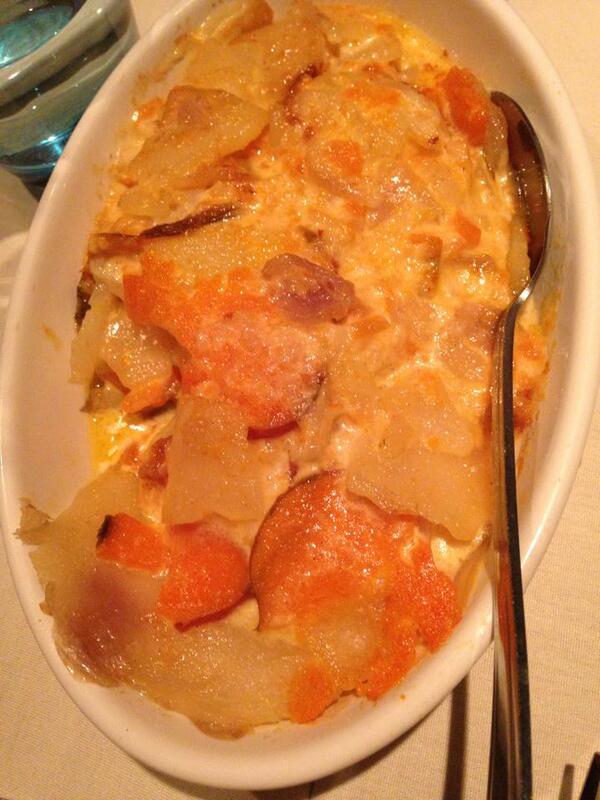 At Napoleons, all main courses come with a selection of veggies, plus a side order of super-cheesy potatoes. 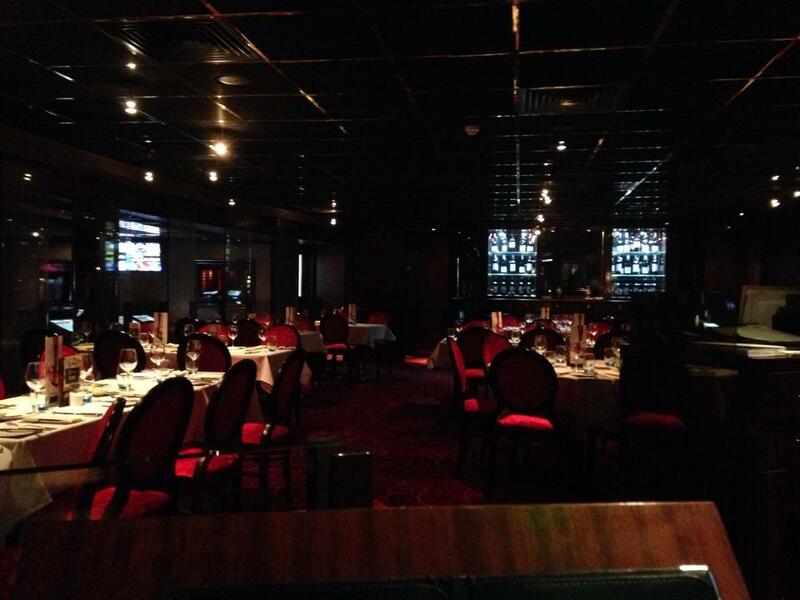 If you book a table at Napoleons, there’s no way you’re going home hungry! I’d already eaten a whole swordfish steak, plus portions of parsnip soup, onion bhaji, prawn cocktail, and two pieces of goat’s cheese bruschetta, and there was still a whole platter left to go! I was on the verge of slipping into a food coma at the table, but there was no going back now – it was pudding time. First up was a small pot of gingered apple and plum crumble with vanilla custard. The crumble and custard were light, and the fruit filling was a nice mix of tart and sweet, although I couldn’t really taste the ginger. The second mini pudding was a portion of dense chocolate brownie. The brownie had a very rich, strong chocolate flavour without being overly sweet. My only grumble is that the brownie was a bit dry on its own; a drizzle of chocolate sauce would have been appreciated. I’d saved the best until last, because the final pudding was a warm ginger cake, complete with a drizzle of sweet and spicy ginger sauce. The cake itself was lovely and moist, and tasted really strongly of ginger, which I love. This is a very satisfying pud that’s perfect for the colder months. I’m looking forward to paying a repeat visit to Napoleons just so I can order a full-sized piece of this cake! Food dispatched, there was just enough time for a complimentary £5 spin on the roulette wheel (which I didn’t win) and then it was time to head home. I was really impressed by Napoleons’ new menu. When you’re in the mood for a slap up meal, this casino may not be the first place that springs to mind, but they serve quality food with plenty of restaurant flourishes – case in point, that quirky parsnip cappuccino. You also can’t complain about the prices, as you can get a three course meal for either £19 or £21, depending on whether you dine on a weekday or a weekend. For the quality of food Napoleons serves, this is a bargain! 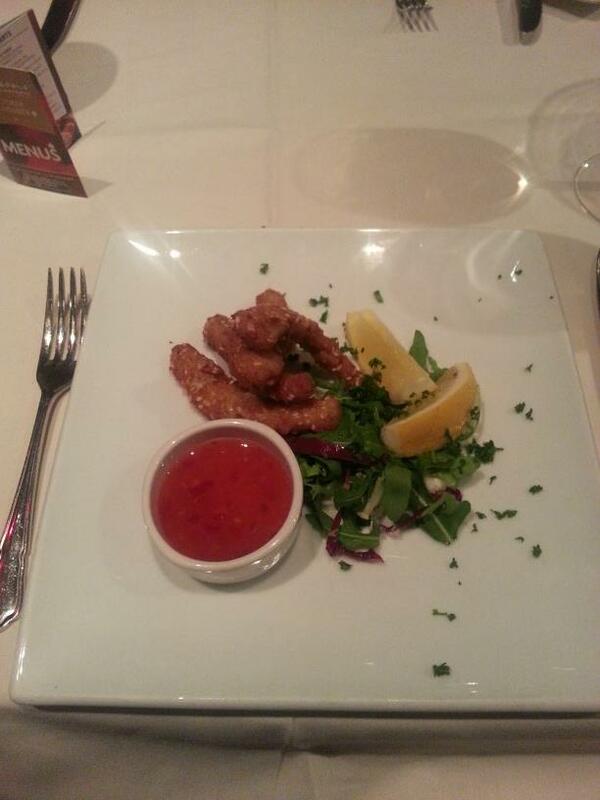 If you’re planning a visit to Napoleons Owlerton, I can highly recommend you eat there too. In fact, even if you’re not planning on visiting the casino, it’s worth taking a look at the menu anyway – you may just surprise yourself and pay Napoleons a visit for the food alone! Recently, we were lucky enough to get an invite to a ‘Foodie Adventure,’ which promised a tantalising evening of eating, drinking and trying our luck at Sheffield’s casinos and dog track. The night would start at Napoleon’s Owlerton where we’d get a roulette lesson, not to mention our first course, before the fun moved next door to the Owlerton Stadium dog track, where it was all about the main meal and a flutter on the dogs, before wrapping things up with a pudding at Napoleon’s Ecclesall Road. Even better, all of the money raised during the evening would go to the Sheffield Food Bank – what’s not to like? I have to admit that before my Foodie Adventure, my entire experience of casinos and dog racing came down to a single trip to Owlerton Stadium, where I placed a few 50p bets and went home with a whopping £1 profit. My experience of eating in these sort of venues was even more limited (read: completely non-existent) so, I had absolutely no idea what to expect when I stepped off the tram and Google-Mapped my way to the first venue. If you’ve never visited Napoleon’s Owlerton on Livesey Street before, the outside has a bit of hotel vibe, with lots of fountains, shiny stone surfaces and Chinese lanterns – but with a lot more neon lights than you’d expect from your average hotel! First on the itinerary, was a quick drink in Napoleon’s bar. The bar area is compact but stylish, with super-shiny surfaces, lights and glittering booze bottles in every direction, not to mention a big sign proudly proclaiming that they serve booze until the eye-watering hour of 5am! The cosy, glossy bar area really sets the tone for an evening at Napoleon’s, as when we made our way through to the restaurant area, we were met with yet more shiny wood and clever lighting, which creates the feeling of an intimate restaurant. Napoleon’s are clearly making the effort to create a dining experience that contradicts any preconceived notions about the kind of food a casino might serve. The menu too, works hard to impress and is bursting with lots of upmarket-sounding ingredients: mojito syrup, ruby port, and thyme jus, to name a few. Not wanting to spoil my appetite so early in the evening, I played it conservative and ordered the mozzarella, tomato and rocket salad, which came with a flourish of basil, capers and balsamic vinegar. Napoleon’s tomato salad has nothing in common with the boring iceberg-lettuce-and-grated-carrot side salads you sometimes get when eating out, and it actually turned out to be my highlight of the entire night, food-wise! The tomato was fresh and full of flavour, while the cheese was surprisingly light. The amount of basil, oil and capers on the plate was carefully balanced to complement the tomato and mozzarella, rather than overpowering them. Who said salads had to be boring? If I ever find myself back at Napoleon’s, I’ll definitely order this again! At the other end of the table, it was all about the Thai spiced fish goujons and sweet chilli dip. The batter was light and completely free of grease, just what you want to kick off a three course meal, and the chilli dip was a nicely tangy accompaniment! After finishing our starters, there was just enough time for a quick roulette lesson, before heading next door to Owlerton Stadium, Penistone Road. I’ve visited the stadium before, but only made it as far as the bar and betting window, so it was interesting to see more of the stadium. After being teased with the fantastic views available to those in the Executive Boxes, it seemed inevitable that our table in the Panorama Restaurant would be a rude return to Earth. Surprisingly, it wasn’t – the restaurant was heaving and had the sort of atmosphere that hits you the second you walk in, and even though it wasn’t the top-dollar Executive Box, the Panorama Restaurant still had impressive views over the entire track. The stadium runs a bargain £17 deal that includes admission fee, a table at the Panorama Restaurant, a three course meal, and your own tote runner who places all of your bets for you (and delivers your winnings, if you strike it lucky!) Although we only spent our main course at the dog track, it was clear that a full evening here would be a lot of fun. But what about the food? I ordered a filling pancake cannelloni of roasted aubergine, courgette and asparagus, topped with a thick two cheese sauce. Beneath that cheesy exterior, were big chunks of veg and lots of pasta, not to mention lashings of that extra-cheesy sauce. A very stodgy and satisfying main, perfect for the winter months. My dining companion’s meal of chargrilled sirloin steak with bourguignon garnish, ruby port and thyme jus was just as tasty. The main meals were served with a platter of vegetables and side orders, which included crispy roast potatoes, broccoli and cauliflower smothered in cheese sauce, and cabbage cooked in lashings of butter and mixed up with more bacon bits – a tummy-warming, calorie-packed treat. But, our Foodie Adventure was drawing to a close, and the only thing left to do was pop over to Napoleon’s Ecclesall Road for pud. Although most of the puddings on offer are of the sweet variety, you can also get that old savoury favourite: the cheese board. 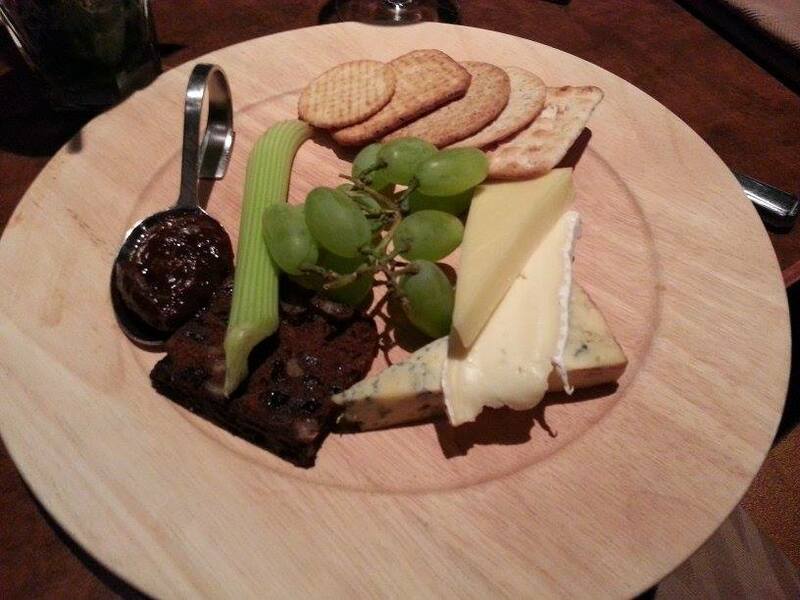 The cheese board in question is made up of mature cheddar, stilton and brie served alongside crackers, chutney, celery and grapes. It’s a sensible size for one person to enjoy, or an after-dinner snack to share between two. So, what did I learn from my first real foray into the world of betting and feasting at Sheffield’s casinos and dog track? Firstly, a meal and a tote runner at Owlerton is a fun, different night out, (even if you’re not particularly into betting, like me) and secondly, the food is completely different to how I’d imagined. All three venues are working hard to counteract those pesky misconceptions about the kind of food you can get at casinos and the races – and it pays off. Far from being convenience food you grab and munch inbetween the fun, the food at all three venues is worth sitting down and taking your time over. If you’re planning a trip to either venue, why not make an evening of it and eat there, too? 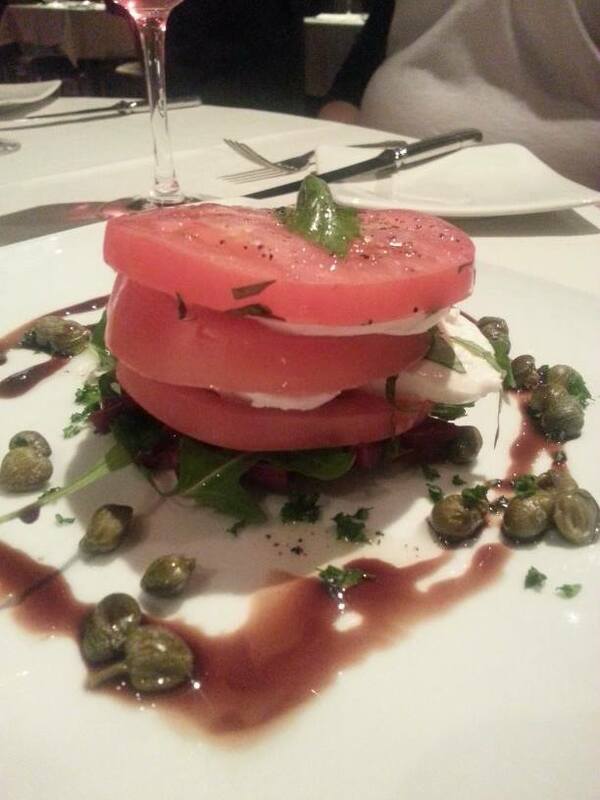 Just make sure you try the tomato and mozzarella salad while you’re there!